This popular fishery takes place from late June through July in the marine waters of Cook Inlet just off the mouth of the Kenai River. Since 2003, Alaskans harvest between 130,000 and 540,000 sockeye salmon annually in this fishery. See the “Permits & Regulations” tab. Through the "Kenai River Late-Run Sockeye Salmon Management Plan" the Department of Fish and Game is directed to manage the Upper Cook Inlet commercial fisheries to minimize the harvest of Northern District silver salmon, late-run Kenai River king salmon, and Kenai River silver salmon. Under this directive, the Kenai River personal use salmon dipnetting open season begins July 10 (to minimize harvest of late-run Kenai River king salmon) and ends July 31 (to minimize harvest of Kenai River silver salmon). Unless an Emergency Order is issued in compliance with the "Kenai River Late-Run Sockeye Salmon Management Plan," dipnetting on the Kenai River is open only between the hours of 6:00 a.m. to 11:00 p.m., regardless of the tides. The harvest limit for the Kenai dipnet fishery is combined with the other Upper Cook Inlet personal use salmon fisheries (Kasilof River dipnetting, Kasilof River set gillnetting, and Fish Creek dipnetting). Your household may take your entire limit from one fishery, or visit any other open Upper Cook Inlet personal use salmon fishery. Also, the household limit is a seasonal limit, not a daily limit. See the “Permits & Regulations” tab for specific limits. In this fishery, there are no additional gear restrictions over what is found in the general statewide definition of dipnet, found under the “Permits & Regulations” tab above. The Division of Commercial Fisheries operates sonar equipment at River Mile 19 to enumerate the in-river number of late-run Kenai River sockeye salmon. Sonar data show that late-run Kenai River sockeye salmon go past the sonar site as early as July 1 and as late as August 10. Since the sonar site is upriver, daily sonar estimates, therefore, do not reflect the number of fish present on that day at the mouth of the Kenai River. To date, the Department has not done any research on how long it takes a late-run sockeye salmon to travel from the mouth upstream to River Mile 19. The Department does have harvest data as reported on the required personal use permit. These data show that peak harvest at the mouth of the Kenai River takes place between July 16 through July 25. 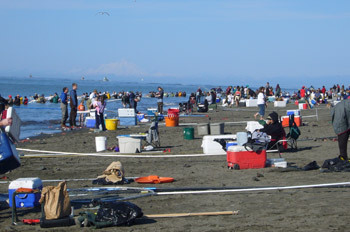 The personal use fishery is open only at the mouth of the Kenai River. Open area from shore: from the commercial fishing markers located in Cook Inlet north and south of the river mouth, upstream to a line from No Name Creek to regulatory markers located on the south bank of the Kenai River and a section on the south bank from the Kenai Landing dock upstream to the downstream edge of the Warren Ames bridge. The City of Kenai has provided a large day-use parking area and limited overnight RV camping at the end of South Spruce Street. Parking & camping spots are marked. The City of Kenai charges fees for parking and for camping. Tow trucks make regular visits to the area. Alaska Avenue (beach road near the parking area) is for loading and unloading only! Since this access road is so narrow, RVs are not allowed. On the north shore, motor vehicles (including ATV/4-wheelers) are allowed only to the west of the vehicle access point (turn to the right). Motor vehicles are not allowed from the vehicle access point east (turning to the left) to the mouth of the river. Four-wheel-drive is required - anything less is courting disaster and a very expensive tow truck bill! Access to the South Beach is from Royal Street via Cannery Road. Follow signs to the staffed fee station at this location. Old Cannery Road is no longer available for fee collection or beach access. There is no beach access or access to the fishery from Old Cannery Road north to Royal Street. To protect the dunes, do not drive your car or ATV above the high tide mark. All areas between mean high water and the dunes is private property so please respect the rights of private property owners in these areas. Camping within these private properties is not allowed unless authorized by the landowner. 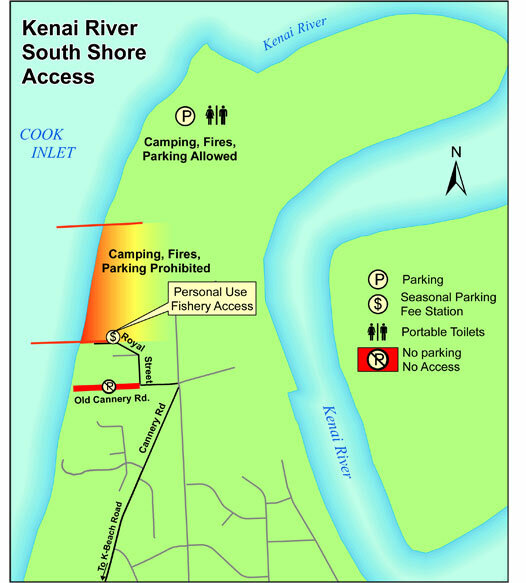 The City of Kenai has provided a parking and camping area near the river mouth. Fees are charged in this area. Camping, camp fires, and parking is only allowed in this area delineated from the river mouth down to city of Kenai markers (located at NE 1/4, SE 1/4, Section 7, Township 5N, Range 11W, Seward Meridian, AK). Four-wheel-drive is also required to get to the mouth on the south shore. Don't drive anything you can't get unstuck, such as a motorhome, down the beach. It is very expensive to get towed. Dipnetting from a boat is allowed during the same open season and times as dipnetting from shore. The same permit, harvest limits, and marking requirements apply. All your personal use fish must be recorded on the permit and the tail fins clipped before going upstream of the Warren Ames Bridge, or you may be subject to a fine. The open area is different than that of the shore dipnetting area. 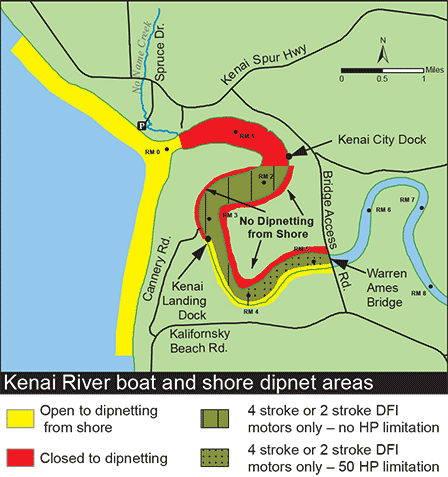 The open area for boats is from ADF&G markers near the Kenai City Dock upstream to the downstream edge of the Warren Ames Bridge. Be prepared for a long wait at the Kenai City Dock, especially during peak days, and before high tides. Please be courteous and bring an extra measure of patience, as wait times can be as long as three hours. The next closest public boat launch on the Kenai River is The Pillars, off the Kenai Spur Road near Soldotna. However, remember that this section of river falls inside the Alaska Department of Natural Resources "Kenai River Special Management Area," and as such is restricted to motors of 50 horsepower or less 24-hours per day, year-round. 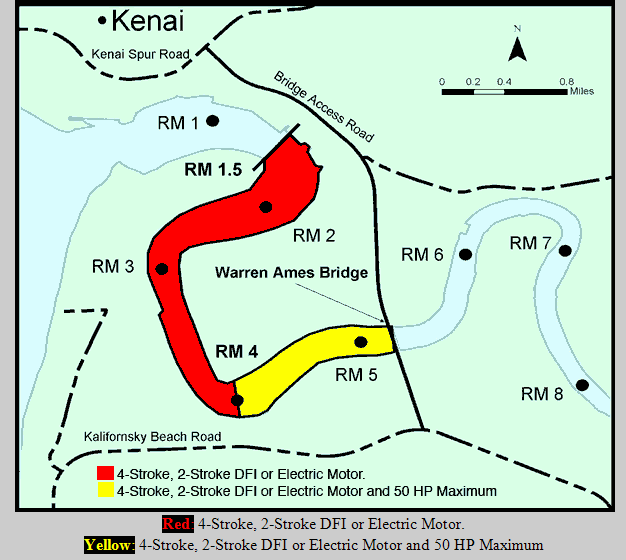 If you launch your boat at a private or public boat launch upriver of Warren Ames Bridge, use caution when boating past the Kenai River king salmon sonar site at river mile 8.5. Only boats powered by four-stroke, two-stroke direct fuel injection (DFI), or electric motors are allowed in the personal use dip net fishery. This regulation prohibits the use of two-stroke motors in the personal use dip net fishery, which occurs in the Lower Kenai River in July. This regulation was adopted by the Alaska Board of Fisheries during their February 2008 Upper Cook Inlet meeting. Water quality sampling over the last 7 years has consistently shown that hydrocarbons originating from gasoline-burning engines have far-exceeded state standards during the busiest days on the Kenai River in July. These repeated high levels of hydrocarbons led the Alaska Department of Environmental Conservation to declare the lower 19 miles of the Kenai River as "impaired". This required the state to take action to alleviate the pollution. The U.S. Environmental Protection Agency has tested and concluded that older two-stroke engines contribute 12 to 20 times more unburned fuel into the environment than a four-stroke engine of a similar size. Prediction models for the Kenai River show that eliminating the use of two-stroke engines during July will reduce the level of hydrocarbons below the state's impaired water quality standards. For additional information regarding the personal use dip net fishery please contact the Alaska Department of Fish and Game, Soldotna Area Office at (907) 262-9368. For information regarding boat and motor restrictions upstream of river mile 4, please contact the Kenai River Center at (907) 260-4882, Department of Natural Resources at (907) 262-5581, or visit the Department of Natural Resource web pages: Fishing the Kenai and Kenai River Special Management Area information. The City of Kenai provides portable toilets on both the north and south shores. The city also provides fish Dumpsters, and garbage Dumpsters on the north shore. There are no garbage facilities on the south shore, and dipnetters must pack out what they pack in. Littering carries a $1,000 fine, and you are responsible for putting your garbage in the Dumpsters or for carrying it out. Camping generally means staying on the beach past the 11 p.m. fishing closure time. If fishing is allowed on a 24-hour basis, the camping fee will be valid for a 24-hour period. Camping will mean setting up a tent or some other shelter on the beach with the intention of staying overnight. Setting up a tent or shelter on a temporary basis, not intended for overnight, is not considered camping. Remember, camping is not allowed in the dunes. There are many commercial lodging facilities available, such as hotels, motels, bed and breakfasts, and cabins. The area also offers commercial fish freezing and processing. Do not camp, walk, drive cars or 4-wheelers, or otherwise disturb the fragile dunes. Foot access is only through established footpaths, and walkways. The vegetation anchors the dunes, which in turn anchor the river beds. The dunes help prevent flooding and erosion and provide habitat for birds and animals. Please respect private property as if it were your own, and do not trespass, including "cutting through" with your vehicle or 4-wheeler. To protect the dunes, do not drive your car or ATV above the high tide mark. Local land managers may have vehicle access restrictions. Land managers have fire restrictions. Refuse service may not be available. Please pack out your own trash. If you are shore fishing, we suggest you wear a life jacket or have flotation readily available. The tides are very strong and can create unexpected hazards. If you are fishing from a boat, life jackets for adults are required by law to be available, and it is law that children under 13 wear their life jacket in an open boat. Use facilities if provided, do not process fish on stairs, on boardwalks, on boat ramps or on parking lots. Dispose of fish waste responsibly by using facilities provided or return waste to the river in small pieces if allowed. If you process fish at home dispose of waste properly by taking the waste to a landfill where allowed. Never discard fish waste onto the open countryside. See the Alaska Department of Environmental Conservation water quality advisory (PDF 227 kB). All areas between mean high water and the dunes is private property so please respect the rights of private property owners in these areas.